Melissa was one of the nymphs that fed honey to the infant Zeus, while she hid him from his father Cronus. When he discovered this, Cronus turned her into a worm. After Zeus came into power, he changed her into a queen bee, since he was unable to change her to anything beyond an insect form. 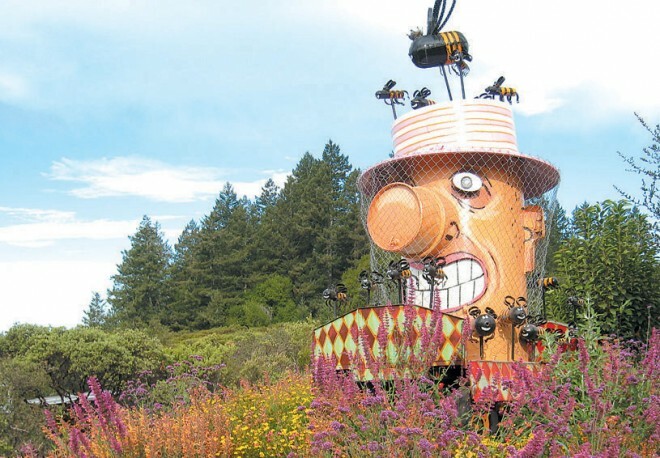 Barbara and Jacques Schlumberger have, for some time, been concerned about the plight of honey bees, particularly Colony Collapse Disorder (CCD) and the unnatural, factory-farm life that many honey bees are forced to lead. It is not fully known what causes CCD. Certainly contributing to the worldwide decline in bee health and bee populations is a combination of pressures from introduced parasites and diseases, pesticides, loss of floral resources, high fructose corn syrup diets, living in hives trucked around the country, and queens with pests and diseases transported all over the world. Honey bee numbers have been declining since the 1940s; such huge numbers are dying now that the alarm is sounding almost worldwide. 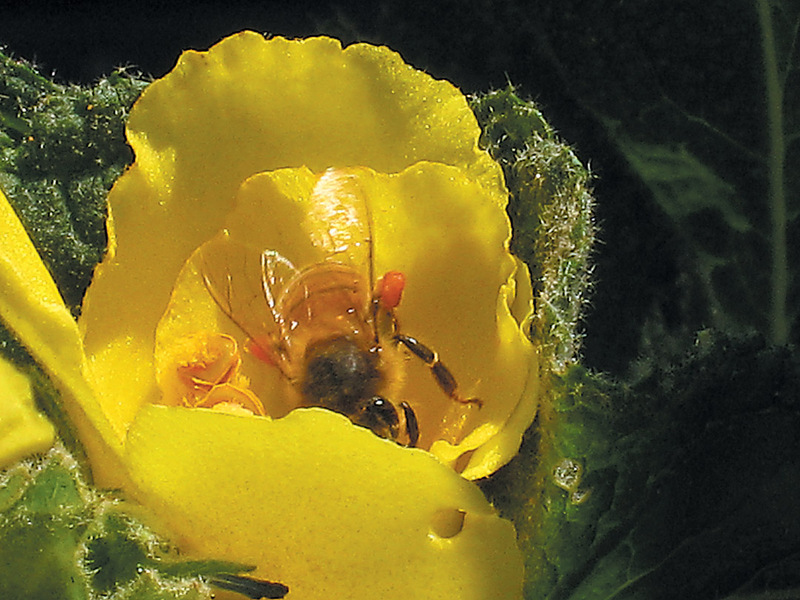 One-third of our food crops are bee pollinated, and eighty percent of our foods require some pollination services. Between a third and a half of hives are dying, a situation that affects commercial beekeepers economically and worries farmers and governments about the potential loss of crop pollination. The site Barbara had in mind was a fenced vegetable garden at her home, which sits at the top of a ridge above Westside Road. The site has a wide variety of soil and habitat types, from thickets of manzanita (Arctostaphylos spp.) to dark groves of Douglas-fir (Pseudotsuga menziesii), California bay (Umbellularia californica), and live oaks (Quercus spp.). The bees gather resin from the firs to make propolis, a natural antibiotic that they use to keep their hives hygienic. The soil where the garden was to go is heavy serpentine clay; the last thing the former owners said as they drove away was “nothing grows here!” Because it is at 850 feet above sea level and fairly near the coast, the property is almost frost-free. The view from every spot on the property is spectacular. We began by changing the square, southwest-facing garden site into a circle. Gnarled live oaks formed a semi-circle at the back of the garden; their positions and the rounded outline of their crowns suggested curving lines. A circular fountain marked the middle of the garden, which was bisected by two paths. We decided to keep the paths, and used the fountain as the centerpiece. We tilled in lots of dairy and grape-pomace compost and laid Netafim inline drip irrigation lines in a grid pattern. The garden was divided into three irrigation zones on an automatic timer. Juan Rodriquez, from Guanajuato, Mexico, and his two helpers outlined the garden with some of the wonderful moss-covered rocks from the property, creating an immediate feeling of age. Juan and his crew did most of the work of installing the garden. We began planting in December 2007, a time of limited plant availability in the local nurseries, and continued planting through May 2008, as plants became available. We had compiled lists of plants attractive to honey bees from Dr Gordon Frankie’s urban native bee study (see Pacific Horticulture, April ’03), Dr Vetaley Stashenko of the Ukraine (now in the United States), various books on honey bees, and personal observation. We wanted a wide variety of species flowering from as early in the season as possible to as late in the season as possible. We thought that, in a natural setting, bees have access to a wide variety of pollens and nectars, and they would seek what suited them. We wanted to fill the garden with plants that really excited honey bees. The first flowers opened in February and March: Greek poppies (Papaver sp.) from Annie’s Annuals and Perennials, Atlantic poppies (P. atlanticum ‘Flore Plena’), borage (Borago officinalis), California poppies (Eschscholzia californica), and the native Phacelia tanacetifolia, which is grown worldwide as bee forage. The poppies released highly attractive pollen in the mornings, causing the bees to do a characteristic “rolling frolic” among the gorgeous anthers. The bees were also busy with the local manzanitas and the wild mustard and radish (Brassica spp.) blooming in abundance on the hillsides and in the Russian River Valley below. Honey bees prefer a profusion of flowering species rather than an isolated plant here and there, which explains why, in some gardens, honey bees were wild about a particular species while, in others, they hardly visited the same plant. Many plants release pollen or nectar only in the mornings. When observing honey bee visits in the afternoon, it might be easy to deduce that a flower was unattractive to honey bees. Many flowers, such as the poppies, cleome, tarweeds (Madia spp. ), and verbascums, are morning producers and have flowers that wilt in the afternoon. 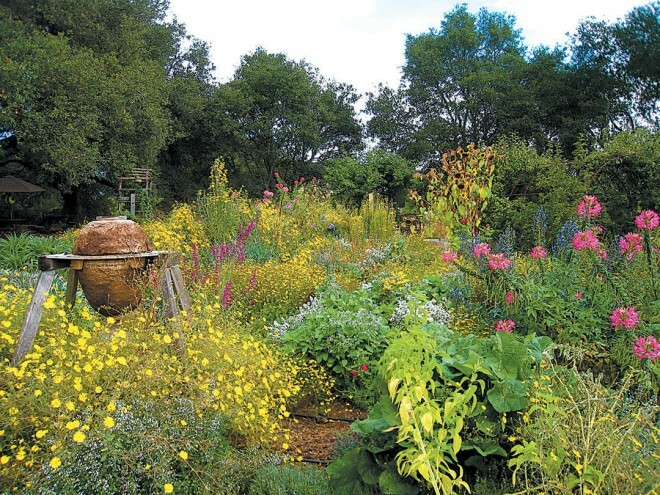 In April, the orchard area across from the garden began to blossom where we had broadcast seed of California poppies, Shirley poppies (Papaver rhoeas), Phacelia tanacetifolia, sweet alyssum (Lobularia maritima), and annual bugloss (Echium spp.). The bees loved the wealth of flowers put forth by these annuals—until the soil and plants dried up as the spring rains concluded. The bees really began spending time in the garden in May. 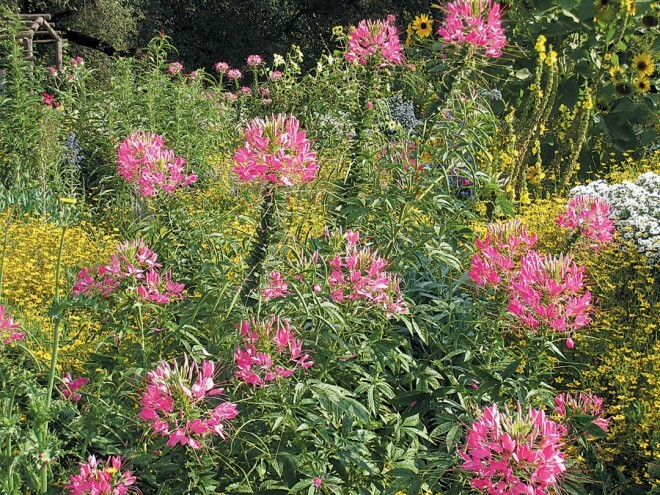 This coincided with the withering of weeds and wildflowers in the surrounding area, but with the Melissa Garden overflowing with a profusion of blossoms. Favorites at this time were the annuals along with catmint (Nepeta spp. 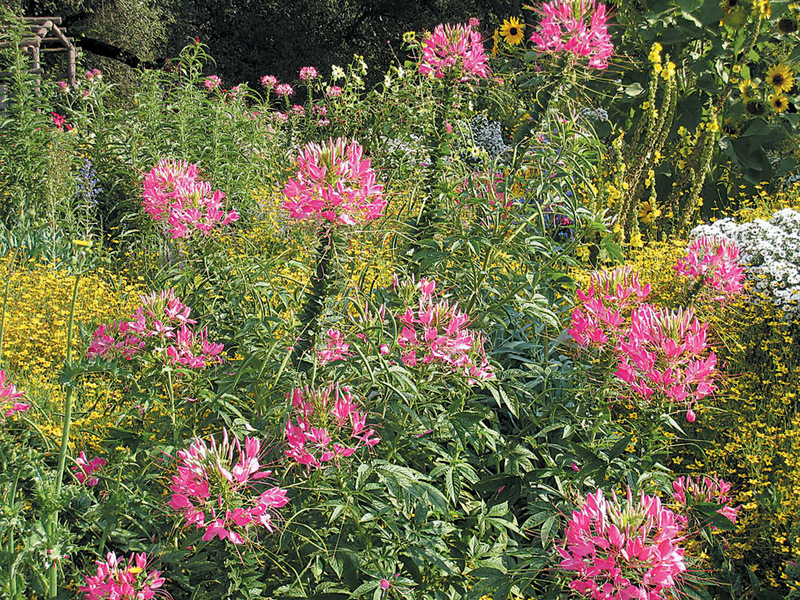 ), verbascums, shrubby species of Echium, Gaura lindheimeri, native milkweeds (Asclepias spp. ), sea hollies (Eryngium spp. ), thymes, sages (Salvia spp. ), blanket flower (Gaillardia spp. ), and California coffeeberry (Rhamnus californica). 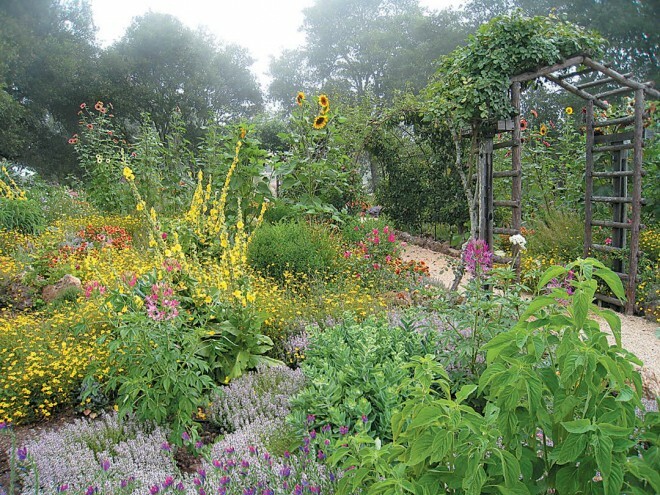 In June, annual sunflowers and cleomes, both cultivated and wild, were favorites of the bees. The native tarweed (Madia elegans), in full glory now, had lots of honey bees until about eleven each morning, when it would close for the day, reopening in the cool of the evening. June and July saw the bees busily foraging on lavenders, thymes, Scabiosa spp., catmint, basket flower, various oreganos (Origanum spp. ), Teucrium fruticans, Bidens ferulifolia, Salvia uliginosa, Verbena bonariensis, goldenrod (Solidago californica), wild buckwheats (Eriogonum fasciculatum, E. giganteum, E. grande var. rubescens), and toyon (Heteromeles arbutifolia). During the hot days of August and September, and into cooler October, California fuchsia (Epilobium ssp.) and hyssop (Agastache spp.) 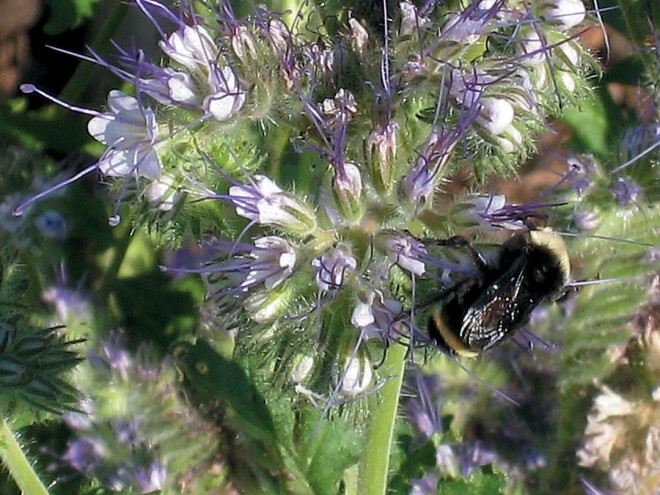 offered plenty of nectar-filled blossoms, but the honey bees were unable to squeeze into their narrow-throated flowers; hummingbirds and longer-tongued bumblebees and nectar-robbing bees visited these plants with greater success. Barbara initially had three standard beehives in her orchard. 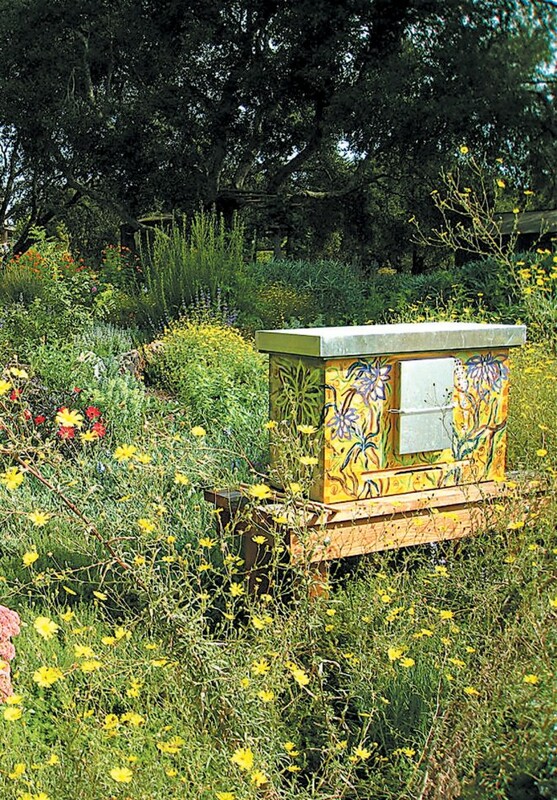 As the garden filled with flowers and bees, she added two new hives designed by members of the German biodynamic beekeeping movement: one HangeKorb, an egg-shaped hive made of straw and covered with manure, and one Einraumbeute, a super-deluxe rectangular hive designed for optimum bee comfort and health. In all the hives, the bees make their own combs. It takes nine pounds of honey to make one pound of wax, so many commercial beekeepers give bees plastic combs to store the honey. Barbara stops taking honey from the hives in mid-summer, so the bees can survive the winter months on their own honey rather than on an artificial, sugar-based diet. In October, Juan noticed a number of bees with deformed wings outside the hives. Shortly afterwards, one of the orchard colonies abandoned its hive to seek cleaner living quarters—a common response to mite infestation. A check of all the hives revealed that the bees had Varroa mites—the plague of beekeepers world-wide. The Varroa mite originated in Siberia and came North America in 1987. It has decimated most feral honey bee populations as well as many managed colonies. The parasitic mites feed on larvae, pupae, and adults, weakening them by compromising their immune systems and leaving them open to viruses (cause of the wing deformation). Mite numbers are usually highest in September and October when forage quality and bee reproduction is declining due to the approach of winter. A strong and healthy hive is less susceptible to the mites. Chemical and organic treatments are available, but with varying efficacy; Barbara prefers to rely on the health and quality of the bees’ food and lifestyle to see if the hives can withstand parasitization. Understanding that a certain proportion of the bees may be lost or weakened, she believes that natural selection for stronger queens and colonies is necessary for the survival of the species. Some beekeepers split their hives often to help keep the colonies vital, thus replicating the natural process of swarming, which commercial beekeepers try to suppress. Each hive exists as an organism that must keep reproducing to stay healthy. The old queen and half the colony are moved into a new hive in an effort to stimulate reproduction. Clearly, there is still much to learn about the life-style of the honey bee to improve management practices. As I write this, a little more than a year later, the remaining fifty percent of the colonies are strong and busy foraging for manzanita, mustard, and wild radish in the valley before the Melissa Garden comes into full bloom. People have begun to contact Barbara with their shared interest in the plight of the honey bee, and their interest in developing healthy environments for them. The idea of a sanctuary that looks outward and inspires the creation of other sanctuaries, small and large, mimics the life cycle of the industrious honeybee. If You Should Like to Visit . . . 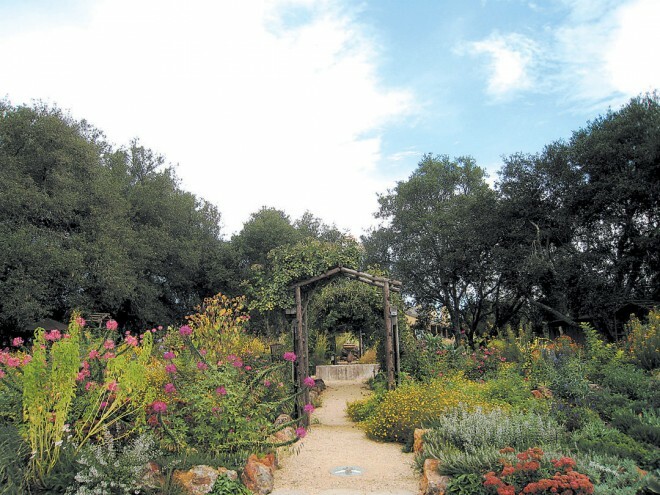 The Melissa Garden is open for visits, tours, and workshops on scheduled days only. Details are available on the website, www.themelissagarden.com.